Apparently the (c) that should have been on the teamsheet before this game was omitted in error, and not to prolong the dangling of anxious Leeds fans who wanted to know who the players had decided would wear the armband this season. It should have been next to Liam Cooper’s name, but that announcement was the prelude to another question: okay, who is going to wear the armband when Pontus Jansson comes back, and Cooper’s dropped? By the end of the game, that situation had become complicated. Cooper was very good, although he started with a frustrating repeat of his play against Oxford United last weekend. Straight from United’s kick off the ball went backwards and was squared across the defence to Cooper, who strode forward, scanned the field, and launched the ball in a straight line to Bolton’s goalkeeper. United. Are. Back. At least it wasn’t diagonal, so that provided some variety, but my concern before this game — and before the season — was whether something would be added to the square passing between Cooper, Matthew Pennington and Felix Wiedwald, or whether that would be it: we’re Reading now, and that’s that. Andrea Radrizzani had apparently targeted Jaap Stam for the head coach’s job, after all, and as he talked to the press this week, it was clear Radrizzani had studied last season’s Championship top six, trying to work out what had got them all above Leeds, assuming that Garry Monk turning out just a straight out snake was not actually a factor. At the same time, though, Radrizzani talked about how he and Thomas Christiansen share a liking for attacking football, that they both believe the team should be controlling games and trying to win, that didn’t tie in with the pedestrian goings on against Oxford. There had to be something more, and with Bolton opting to boot the ball up front at Gary Madine and Adam Le Fondre, there had to be something more, else this game was ready to turn very ugly very quickly. There was some ugliness, but that wasn’t down to Leeds United’s tactics, and before it got ugly this game got real beautiful. Thomas Christiansen is telling the players to attack after all, but it’s not going to be kick and rush. It’s going to be steady, aim, fire; patient periods of passing at the back giving way to well-timed bursts of attacking energy that will aim to catch opponents out and feed Chris Wood quickly, and if not Wood, then Kemar Roofe or Ezgjan Alioski, all three tearing into space for through balls from Eunan O’Kane or Pablo Hernandez. Leeds took the lead early, and that gave them confidence in the new style. The opening goal wasn’t of the new style, but it was a new innovation, a corner routine featuring clever running from Alioski, to distract defenders, and Kalvin Phillips, to meet a low cross from Hernandez and stroke it first time towards goal from the edge of the box. A deflection robbed us all of a netbuster to start the season; instead the net billowed as the ball looped away from the goalkeeper. Phillips ran straight to celebrate with Hernandez, who looked at the young midfielder the way an experienced general might look at a young marine, returned safely from the jungle after his first successful mission. Phillips scored again before halftime. Wood just got his foot to a through ball from Hernandez, that left the striker alone in the penalty area with the Bolton defence stood still staring, their right back Stephen Darby too shy to confess he’d played Wood onside. He’d played Phillips onside too, who was square of Wood, and when he was given the ball, Phillips scored. I hadn’t much to say about how Phillips played against Oxford, other than that he was conspicuously forward for a lot of that game; but Hernandez wasn’t feeling fluid enough that day to find him, so the game tended to happen without Phillips. We saw the sense of it against Bolton as, new contract safely in the drawer at home, Phillips buzzed around the edge of the penalty area and often ended up closest of the midfielders to Wood. Although I was delighted that Phillips was given his long term deal and a chance to develop, I can’t pretend to have ever been a big fan, and I can’t help wondering about the prospect of Ronaldo Vieira, Samuel Saiz or Mateusz Klich getting into the positions Phillips was taking up. But then again, would any of them offer as much defensively as Phillips? It’s always good advice to get yourself a guy who does both. And there has never been a dispute that when he’s good, as he was against Bolton, Phillips is very very good. Two goals split Phillips’ brace, one for Leeds and one for Bolton. One of the big questions about this season is whether Chris Wood, back from the summer break, shorn and bearded like a tough beatnik who sells the best hashish and will have you beaten if you don’t pay for it on time, could get going again like he did last time, and if so, how long it would take. The answer was obvious. If he’s left unmarked three yards from goal to head the ball into the net, then he’ll head the ball into the net. The goal was well worked, and the game’s best example of the Christiansen style in motion. Pennington broke away from some back four passing, running into midfield with the ball and quickly feeding it to Roofe on the right wing. Roofe, the most promising rejuvenation of preseason, didn’t worry about the two defenders in front of him and made for the byline; and although his cross was deflected and went beyond Wood, it reached Alioski, who jumped and span and headed the ball back across goal into the six yard box, where Wood couldn’t miss. Pennington, along with Phillips and O’Kane, was one of Leeds’ best players, good news from a debutante on whom much in the new system relies. He was solid at the back too, taking over from Pontus Jannson as the loose player defending corners, although that didn’t quite work out when Bolton pulled the score back to 2-1. A deep corner to the back post avoided Pennington and left Roofe up against Madine, who headed straight past Wiedwald. Wiedwald, who was dressed like a bottle of Orangina, didn’t really have a chance with the goal and didn’t really have a lot to do. He threw some effective punches at some crosses, but only had two simple saves to make. His presence as a footballer at the back adds to United’s options, although I’m still not sure about Leeds preferring to bring him into the game from wide on the halfway line; it’s safety first, I guess. But I won’t be entirely comfortable with Wiedwald starting ahead of Robert Green until I’ve seen the new guy go through a game the way Green did several times last season: as the brilliant last line of defence, rather than the first point of attack. We might see that sooner rather than later, given injuries and suspensions to the defenders protecting him. The one downside to this game was that first Gaetano Berardi and then Matthew Pennington had to leave the field with injuries — a dislocated shoulder and a damaged ankle — sustained in innocuous circumstances, although glances should be cast in Cooper’s direction about Berardi’s shoulder, given the way Coops used to target Scott Wootton for punishment whenever they played together, and his proximity to Tano when his arm popped loose. For Berardi the injury was cruel. He’s started every season at Leeds needing to fight his way back into the side, first past Byram, then past Ayling and Taylor, and every time he has done it. With Ayling looking like one of the best right-backs in the division, and Cameron Borthwick-Jackson due to arrive on loan, Berardi’s lost the big advantage he had — being in the team already — and will now have to fight again, for a place that isn’t even his position anyway. That’s assuming he doesn’t react like Rudy Austin reacted to his broken leg, and start on Wednesday anyway. Against Bolton Berardi was covered by Vurnon Anita, also right-footed, but Anita looks assured and confident on the ball wherever he plays, so it wasn’t a problem. The problem with Anita might be that he’s so good it’s going to be difficult not to play him in midfield, where there are already enough players staking a claim. Losing Pennington was more of a problem. 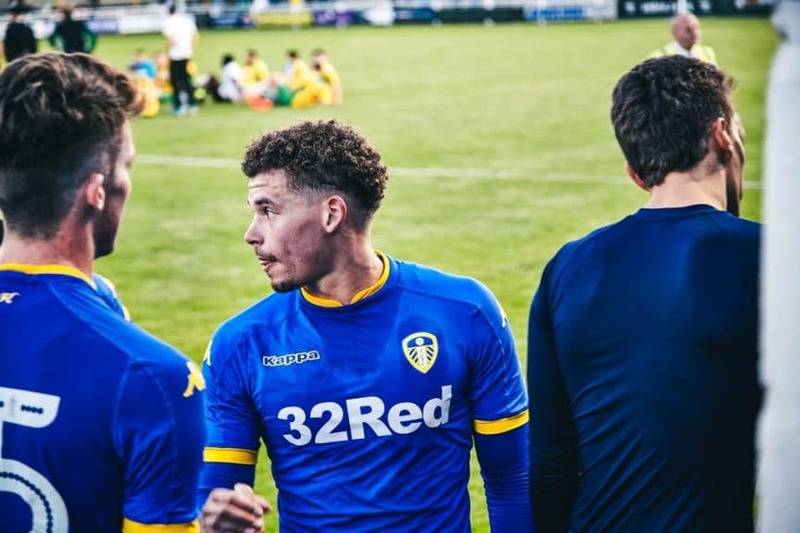 Without a central defender on the bench, Christiansen brought on Conor Shaughnessy, who has come from nowhere to first team debut through this preseason in what I hope is Sam Byram style. It was more of a Lewis Cook at Millwall sort of start, though. Within ninety seconds, defending a corner, Shaughnessy had pulled Madine’s shirt up and over his head, so that the striker looked like Brian Deane celebrating a goal — Deano always did it much better than Fabrizio Ravanelli — and given away a penalty, that Le Fondre scored. It was a cold, harsh start to life as a Championship central defender, but then Conor Shaughnessy is a midfielder anyway. When he joined Leeds Shaughnessy described himself as a centre midfielder who can get forward and back. “I prefer the number eight role and I like to think I can score goals as well,” he said. That’s not a Leeds Clarke/Wallace number eight, but nor is it a central defender, no matter how far you’re splitting them. It’s easily said now, but it was also easily thought at the time, that another option might have involved more disruption, but would have left Leeds with a more experienced side: Ayling to centre-half, Anita to right-back, Alioski to left-back — he plays left wing-back for Macedonia, and was already getting stuck in well to help out Anita — and Sacko on the wing, avoiding the shock effect that making his debut seemed to have on Shaughnessy. If Christiansen is working to convert Shaughnessy to defence, that might be work better done in the U23s, although he did get a good block to a shot from Madine and settled down well enough after the initial disaster. Cooper and Ayling had to work extra hard for the final twenty-five minutes, though, as Bolton targeted Shaughnessy’s side for their increasingly determined attempts to equalise. Leeds resisted all that, and while it wasn’t pretty by the end, three points were a welcome way to start the season, and the memories of the best of Leeds’ play weren’t forgotten, especially given the influence our old foe circumstance had in disrupting the game. Enforced substitutions meant there was no chance for a casual introduction to Saiz, Klich or Ekuban; I’d been hoping one of the first two in particular might have come on to add some late spark. But then I’d been hoping we’d be 6-0 up by then, and I was happy enough with 3-2. The new signings obviously got the attention over the summer, but that Phillips, O’Kane and Roofe have started this season so well is also good news; whether it’s the impetus of competition for places or being better tuned in to Christiansen’s style of play, the more players playing well the better. Roofe in particular got at least three good crosses in to Wood, apart from the goal, that Hadi Sacko could look at and learn a lot from; I’m not going to say much about Sacko’s own contribution as a late substitute, because he’s a nice guy, and I reckon he knows.